Skyline Panel track by Hunter Douglas has clean lines and a sleek urban contemporary look. Skyline Gliding Window Panels offer the perfect solution for both large and small windows, and can also be used as a stylish room divider system. The hardware system has a fashion-forward fabric collection that will dress any window in style. Clean, crisp and modern, Skyline Gliding Window Panels offer a sleek answer for both large and small windows. In the open position, the Skyline Panel Tracks stack to the side to offer a view. When closed, they display their rich fabrics and texture. They also make a stylish and effective room divider system, and coordinate with Designer Screen Shades and Designer Roller Shades. Skyline Gliding Window Panels are on Display with Power Glide at our Hunter Douglas Showcase Showroom on Crowfoot Crescent in North West Calgary . .
Drop by Our Crowfoot Showroom to View Samples and Purchase Your Skyline Panel Track . . . . 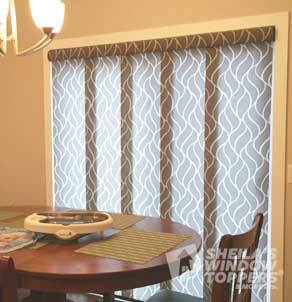 Learn more about Skyline Panel Track Shades.